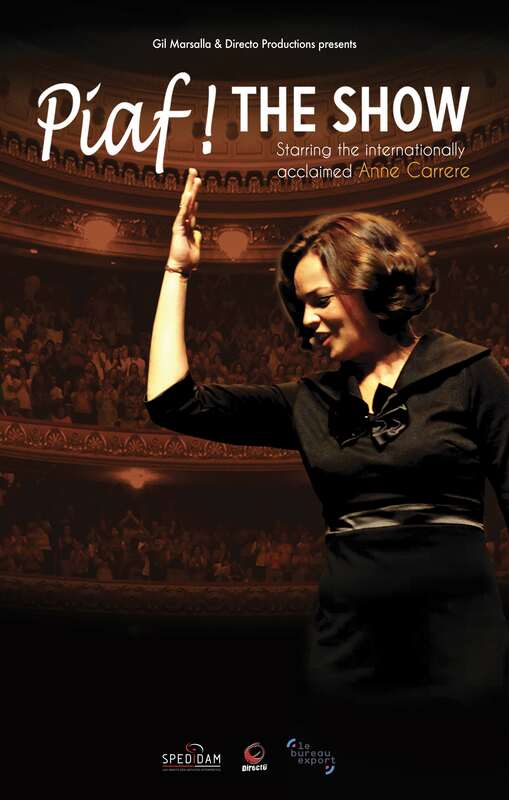 With a million tickets sold in more than 50 countries and acclaimed reviews worldwide PIAF ! THE SHOW – a musical celebration of the life and music of the legendary French chanteuse EDITH PIAF – returns to America as part of the extended world tour. The highlight of the American leg of a 300 performance global tour was the special presentation at Carnegie Hall on January 6, 2017 on the 60th anniversary of Edith Piaf’s last performance at the famous venue. Conceived and directed by the Nice-based theatrical maverick Gil Marsalla and starring Anne Carrere, a young French performer hailed as “Edith Piaf’s legitimate musical heiress” PIAF ! THE SHOW premiered in 2015 as a tribute to “The Swallow of Montmartre” on the centennial on her birthday and was inspired by the award-winning movie La Vie En Rose. In two 45-minute acts, the show narrates the rags-to-riches story of the Parisian singer’s career through her unforgettable songs, complemented by a visual tapestry of previously unreleased photographs and images of famous Parisian locations of the Edith Piaf era.